Guest Post | Darker Still’s Leanna Renee Hieber and a giveaway! Today, we’re welcoming the fabulous Leanna Renee Hieber to the blog! Yesterday, I posted my review of Darker Still, which is simply AMAZING. Seriously, I just fell in love with this novel, with its wonderful heroine Natalie and with the oh-so-swoon-worthy Lord Denbury. 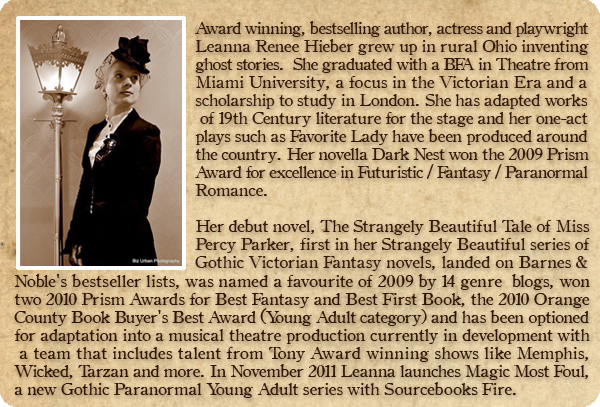 Inspired by several different classic works, Darker Still is an exciting and romantic Victorian-era, paranormal mystery. In writing Darker Still, Leanna has made several statements about wanting her novel to be a catalyst for encouraging more young adults to read classic literature, which I believe is a really wonderful goal. I know I wish I had been encouraged to read more literary classics as a teen, and aside from several that I read in high school and college that were part of my coursework, I’ve only recently started to pick up more classic works. But you aren’t here to hear me….talk about me. <wink wink> So without further ado, I give you Leanna Renee Hieber! So….Leanna, ( and I’m totally using my cheesy announcer voice right now…just a FYI) can you tell us a little bit about you inspiration for writing Darker Still and you motivation behind encouraging teens to pick up the classics? Well, since I can remember I have been a teller of ghost stories, so the paranormal has always appealed to me, as has the historical (blame it on the pretty dresses). I’ve always wanted to write a haunted painting story ever since I saw Sesame Street’s “Don’t Eat The Pictures” where the whole gang gets trapped in the Metropolitan Museum of Art after hours. (That, and living in NYC was the primary reason for setting so much of the book at the old Met). And then after reading The Picture of Dorian Gray, I was done for, I HAD to write a haunted painting story and I just had to wait for the right characters to bring it to life, and, like everything I do, to do it my own way. Thankfully Natalie proved a spunky and engaging heroine that, despite her disability, has such a distinct narrative voice that she enabled my idea of so many years ago to have it’s own unique life. Also, my first literary obsessions were all 19th century Gothic novels, many of which have paranormal aspects, and so in the Magic Most Foul saga, I’m returning to my first and foremost literary influences. Gothic novels taught me how to get swept up heart and soul into a book and I’ve adopted the Gothic framework as my template. SO that leads me to your second question, as to why I am motivated to bring the classics to a YA audience. I’ve often said with this series that I want to be a “gateway drug for 19th century literature”. I want teens to not be afraid of big words and an immense, rich vocabulary. I want every reader to be swept away to another time period and experience the way it’s similar and different to today. I want a teen to see that this novel is written in epistolary form (diary entries, letters, articles) and then be able to pick up Dracula and recognize that same style and have fun with it. I want teens to know that Mary Shelley wrote Frankenstein when SHE was just a teenager and to be as inspired by that fact as I was at age seventeen. I want to share how giddy and in love I was with 19th century literature when I was a teen, how it was the most wondrous escape. So this isn’t me, at the age of 32, trying to impress ‘old adult things’ onto teens, I want to share what has been my long-term passion; my favourite teenage inspirations. Cheers and happy reading, Happy Halloween! Thanks so much for coming on the blog today Leanna! And for my fabulous readers, you really need to get your hands on a copy of Darker Still… which you can pre-order from Word in Brooklyn, NY — support a great Indie Bookstore AND get a signed copy. Win win. You can also enter my giveaway for a chance to win a SIGNED COPY, as well. Hmm . . . is classic pre-1900’s ? I’d have to say Mark Twain, he is easy to read and very satirical. Anything by Austen. She rocks my world and makes me giggle every time!! Voltaire counts right? I’m going to go with Candide! My favourite classic author would be Jane Austen Thanks for the giveaway! As of recently, my most favorite work of classic literature is The Canterbury Tales! Anything from Jane Austen. Thanks for the giveaway!! I’m going to have to go with many of the others and say Jane Austen, Pride and Prejudice is one of my all time favorite books. I LOVE anything by Shakespeare or Edgar Ellen Poe! Oscar Wilde! Seeing The Picture of Dorian Gray, one of my favorite books, partly inspired Darker Still is making me want to read it all the more now! Jane Eyre – by Charlotte Bronte. seem to read the book over again. I took a seminar on Oscar Wilde and he’s definitely one of my favorites, so this book seriously excites me. I also love the gothic literature – just read Zofloya by Charlotte Dacre and that might be a new favorite. I think I love just about anything by Austen, myself, really. I am quite fascinated with those novels. Thank you, so much for the lovely giveaway, as I am quite excited to read this novel. Definitely going on my to-read list! I love almost anything by Edgar Allen Poe! Thanks for the wonderful giveway! Ohhhhh, my favorite was either Pride and Prejudice or Emma! I loved those, but Jane Eyre was also a good book. Too many to decide. My favorite classical author is Edgar Allan Poe. I love his writting! My favorite classic author is Charlotte Bronte. Jane Austen wins hands down. Thanks for the giveaway!! The Picture of Dorian Gray of course! But also Edgar Allen Poe :). I haven’t read any classics in a long time! Some of my favourites from school included The Glass Menagerie, Ethan Frome, and Flowers for Algernon. Ooh, it’s definitely a tie between Jane Eyre and Wuthering Heights! Another brilliant giveaway, Dani! My favorite classic author would have to be a tie between Charlotte Bronte and Jane Austen, and my favorite classic story is Jane Eyre by Charlotte Bronte. I love Jane Austen and Edgar Allen Poe. I love Jane Austen. Thanks for the giveaway! My favorite classic author is Mark Twain. Jane Austen hands down! Emma is my fav!